The U.S. Drug Enforcement Administration (DEA) announced on October 4th, 2016 that plans to reduce opioid manufacturing by 25% next year are underway, citing a shrinking market and the epidemic of abuse as primary reasons. Since doctors are working to reduce the number of opioids they prescribe, the DEA is following suit by cutting down on the allowed quota. The DEA is making the move, even though pharmaceutical companies and advocacy groups spent $880 million on campaign contributions and lobbying initiatives from 2006 through 2015. That amount is 8 times what gun lobbyists spent, and 200 times more than advocates for stricter policies shelled out during the same time period. Hydrocodone production will be cut by 34%. “Earlier this year the CDC issued guidelines to practitioners recommending a reduction in prescribing opioid medication medications for chronic pain. Purdue went on to plead guilty to misleading the public about the risk of addiction to the painkiller OxyContin, and paid a fine of $634.5 million. “Fourteen billion opioid pills are now dispensed annually in the United States – enough for every adult American to have a bottle of pills. However, reducing the amount of prescription opioids can cause other problems. For example, in 2011, Florida Gov. Rick Scott started cracking down on pain-management clinics that were suspected of dispensing too many opioids. 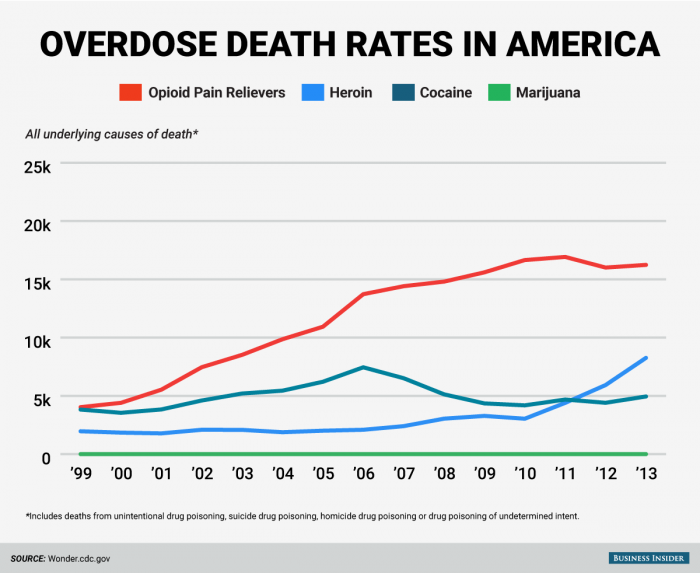 The good news from Scott’s decision is that prescription-drug overdoses fell within the first year. The bad news is that heroin deaths climbed 39%, as people who couldn’t get their prescription painkillers turned to the illegal drug. Meanwhile, the DEA decided in August 2016 not to reschedule marijuana from a Schedule I substance to a Schedule II substance. That means marijuana remains in the same group as heroin, LSD, peyote, ecstasy, quaaludes, and bath salts. Rescheduling marijuana would have made it legal for medical use nationwide. Interestingly, cannabis has shown promise in studies in treating addictions to hard drugs, including opioids. Julie Fidler is a freelance writer, legal blogger, and the author of Adventures in Holy Matrimony: For Better or the Absolute Worst. She lives in Pennsylvania with her husband and two ridiculously spoiled cats. She occasionally pontificates on her blog.